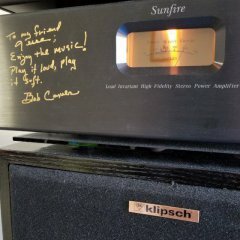 Willing to pay up to $1200 for RF-83 in excellent condition, about $900 for KLFs or the CF-4s, about $600 for KLF-20s or CF-3s. I don't mind driving a few hours to get them. I'd like to secure a deal for one of these models before attempting to sell the P17's. Or work out a trade if somebody is interested in the Palladiums. Had the RF83, KLF30 and the CF3 and CF4. Still have the KLF30. Have you had / have room for the Chorus II? Maybe add RF-63's to your list. Tight, accurate bass, 3-way like midrange, and great overall balance. Yes, but I decided that I'm not a Heritage guy. Someday I still want to try LaScalas or K-horns though. Try the whole "fully horn-loaded" thing. I like the way the materials from the Ref and Palladiums sound, and I absolutely just love designs of the Legend and Epic series. Now that I've owned the P17b's, I feel like I've tried all the different series and it's time to hunt down my overall favorites. The man can't help what he likes, lol. Maybe I should add them. I just want a huge pair of mammoth Klipsch, but I see that the 63's have the specs of a very large model. Does it seem like they actually reach down to 30hz? Yeah, I don't think I would be happy with the Corwalls for very long. Bummer about those 83's! It's going to be a while until I find another pair. And does anybody know if the KLF-20s actually do have deeper reaching bass than the KLF-30s? Is it noticeable? Are the 30's still superior? From what I understand the frequency response ratings for each speaker is their -3db point. 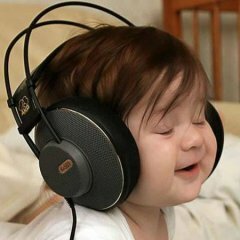 Since the 30's actually play louder than the 20's they will surely hit the same notes as the 20's, and probably just as loud as the 20's, just more than the -3db of their own rated response if that makes any sense?? Ah yes, that actually does make sense. I've got a mint pair of RF-83's stored away along with a ton of other speakers. I was planning on buying another house with a large basement for my audio room. Unfortunately that doesn't look like it's happening any time soon. I've been debating selling off some stuff. The problem is I live in NY and don't have the original boxes. Do you want to hear the bass or feel the bass? Is this for 2 channel or HT? I've had the RF63. They are impressive for what they are. 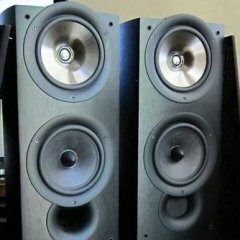 I agree with others who say that they are the best 3 way sounding 2 way speakers. No I'm not selling you back the RB75's!!! They just keep impressing me. I swear their on steroids.